Spent today trying a bit of Dutch culture. The photo depicts tulips, which will be the only tulips we’ll see this trip – the cold snap delayed them a bit. And the treat is a stroopwaffel – a sugar waffle, like a waffle cookie with a caramel/maple gooey filling of deliciousness. 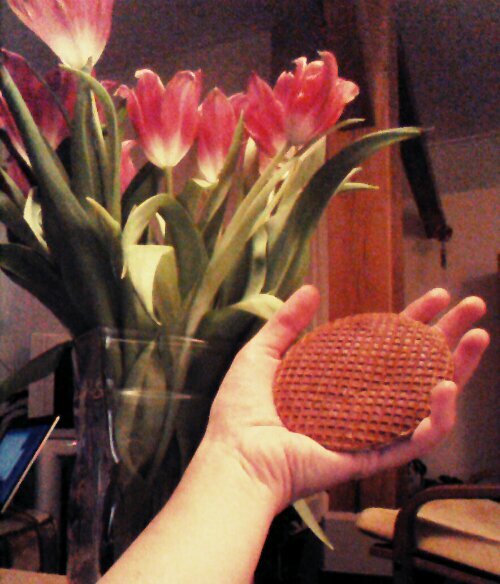 A favorite Dutch treat. Today we explored the largest IKEA in The Netherlands and had some amazing pie at the oldest cafe in the country, established in 1478…yes, before Columbus sailed the ocean blue. We woke to snow and while it did melt during the day, it never got far above freezing temps. Our dinner was a delicious Dutch dish of sausages, boiled potatoes, and red cabbage with apples and garlic. Breakfast here is bread with either cheese or chocolate sprinkles. Yes! We ate lunch at IKEA, of course….and their special today was German chicken schnitzel. Nothing like being in The Netherlands, in a Swedish store, eating German food to celebrate the EU as a whole!